I can't do the above example because is_main is not part of the "image" table. But it not worked. 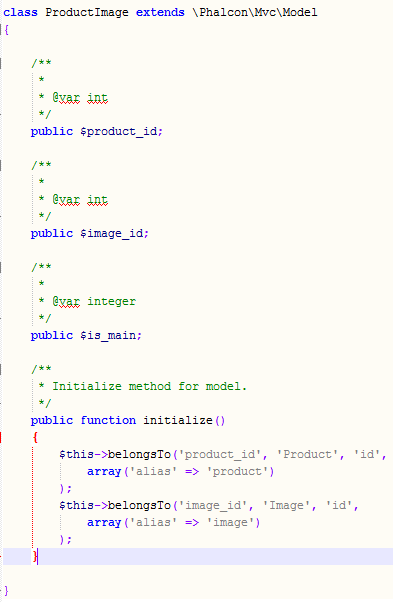 In short, I want to access the "is_main" attribute when I have a product instance. Can I access the "is_main" attribute and the respective image table using only one database request? I think I don't need to post my product and image models. Hahaha, I did set $this->hasManyToMany('id','ProductImage','product_id','image_id','Image','id',['alias'=>'images']); but didn't set $this->hasMany('id','ProductImage','product_id',['alias'=>'product_images']); So that is why my second example didn't work. Thank you very much! Better to use queryBuilder and joins..... instead of doing foreach and so many selects.